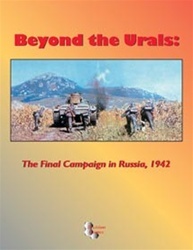 Beyond the Urals is a two-player strategic-level simulation of a campaign that might-have-been in Russia during World War II. Beyond the Urals postulates that the Germans had defeated the Red Army in their 1941 invasion of the Soviet Union, but failed to force the capitulation of the Soviet Union itself. In early 1941, Soviet leaders had decided to deploy their armed forces "up front" on the border with the Third Reich, as chief of the Red Army armored forces, Gen. D.G. Pavlov, had proposed. As a result of this alternative deployment, the Germans destroy the Red Army on the frontiers, sweep eastwards, and take Moscow, Leningrad and Stalingrad in late 1941. However, in this alternative time-line, the Soviets keep fighting even after the Germans reached their planned Archangel-Astrakhan stop line. Being given no alternatives other than to suffer the consequences of German exploitation and terror in the East, or to continue a desperate resistance, the Russians and other Soviet peoples go on fighting. The remnants of the Red Army make their stand to protect the great industrial complexes east of the Urals, hoping to draw in the Germans for the final decisive battle. As 1942 opens, Hitler orders the Wehrmacht to head into the East for the final battle of annihilation in Eurasia, beyond the Urals. Each hex on the map represents approximately 20 miles (32.4 kilometers) from side to opposite side. The Soviet units of maneuver are armies, while all German units are corps. Air power is represented abstractly, with two counters representing the effects of German tactical air superiority. Each full game turn represents one week. Components: 34x22” mapsheet, rulebook, 176 die-cut counters, storage bags (ziplock).